Betel is widely used in Thailand as a simple wrapper in formiang kham, and as part of the age-old natural stimulant Chien Mahk. In Vietnam, betel leaf is cooked (often over charcoal) which brings out more flavor. We love cooking beef and pork inside the betel leaf, a recipe called "Bo La Lop" which we learned from a local Vietnamese family. In a mortar and pestle or spice mill, crack the peppercorns and set aside. Combine beef and pork in a bowl, then add garlic, shallot, lemongrass, five spice, fish sauce, sugar, peppercorn and salt. Mix well and set aside in the fridge. Prepare the betel leaves as shown, by removing each leaf from the vine, leaving the stem. 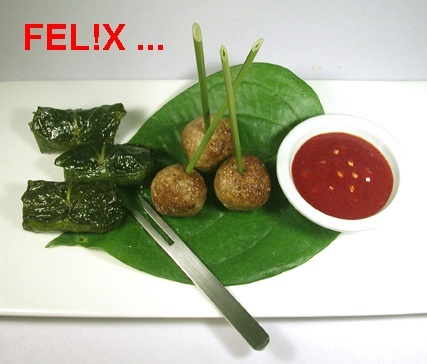 With glossy side down, place a small spoonful of meat on the leaf, fold and roll up as shown in pictures at right. Poke a hole and push the stem inside to keep the little bundles secure. At this point you can do as we did (take the easy route), and simply cook them in a skillet with a bit of vegetable oil, over low heat. They cook through within about 10 minutes and taste delicious. For a more authentic preparation, cook over charcoal. Our Tao burner would work perfectly for this. Serve with sriracha sauce as a nice condiment. Enjoy! I plan to try this recipe very soon. I find that the Betel Wrapped Beef and Pork, Bo La Lop looks very similar to the "Dolmathas" ground lamb rolled in grape leaves that is part of my Lebanese culture.